James Graham’s play The Angry Brigade recently brought the leftist activism and direct action of early 1970s London to the stage. Howard Brenton’s 1973 play Magnificence concerns the same moment in revolutionary history. Both depict young protestors debating direct violent action, and show authorities bewildered by the intense anger of the youthful left. 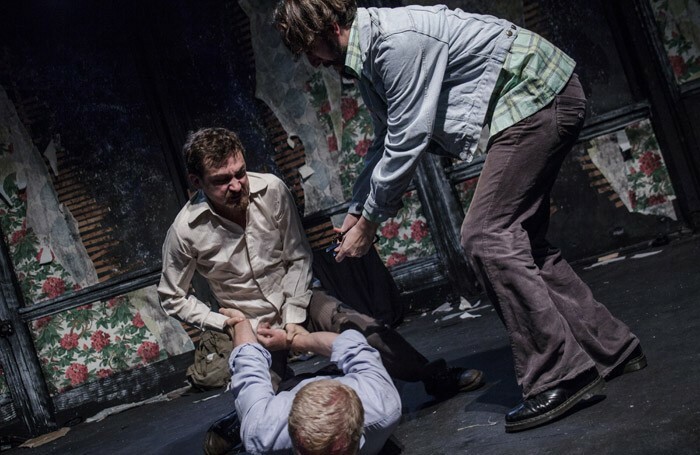 This first professional revival is especially relevant given the play’s focus on housing, opening with a motley Marxist crew occupying an abandoned building. When the play moves on, designer Phil Lindley keeps us in that first room, wooden laths exposed behind discoloured wallpaper, making of us aware of the idea of invasions of space in what follows. Deft lighting by Joe Price, both hi and lo-tech, and clever, simple staging make the remainder of this big play fit in to the intimate Finborough space. Magnificence is a tightly focused story about radicalization and political gesture, but Brenton’s style shifts abruptly as needed. Broadly naturalistic scenes are interrupted by Beckettian rituals and at one point Lenin arrives onstage, a figment of one character’s imagination. Director Josh Roche attempts to accommodate this variety with an intermittent revue tone – a nervous double act between Chris Porter and Tim Faulkner as a bailiff and a policeman is a highlight. But while the final showdown between a furious radical (Joel Gillman) and a Tory career politician (Faulkner) is riveting, the whole production lacks a through-line, and feels far less anarchic, and less driven, than the text.